Fall has lasted forever here, but winter is just around the corner and with it holiday time! Is it just me or do the dresses that come out around this time of year shock you? What I'm talking about is the fact that there seems to be an awful lot of dresses that flood the market for the "holidays" and they are more often than not, wispy little things, sleeveless and well, they look like you could catch a death of cold in them! It's something that I think about every year when this part of the year rolls around. "Gosh that's a pretty dress, but I wouldn't be caught dead in it in this weather" as I look outside and see snow falling. Granted I live in a state where the snow does fly and it can get pretty cold. And in general, I get cold and I'm always bundled up to the nines and in something much more dreadfully boring than those fun holiday dresses. Anyhow, I was thinking about all of this when the idea hit me that I needed more winter friendly dresses. I got myself over to a local chain fabric store on my lunch hour one day and started gandering at the Newlook book. I don't know why, but I always overlook the Newlook and Kwik Sew patterns. Newlook has some pretty great patterns. 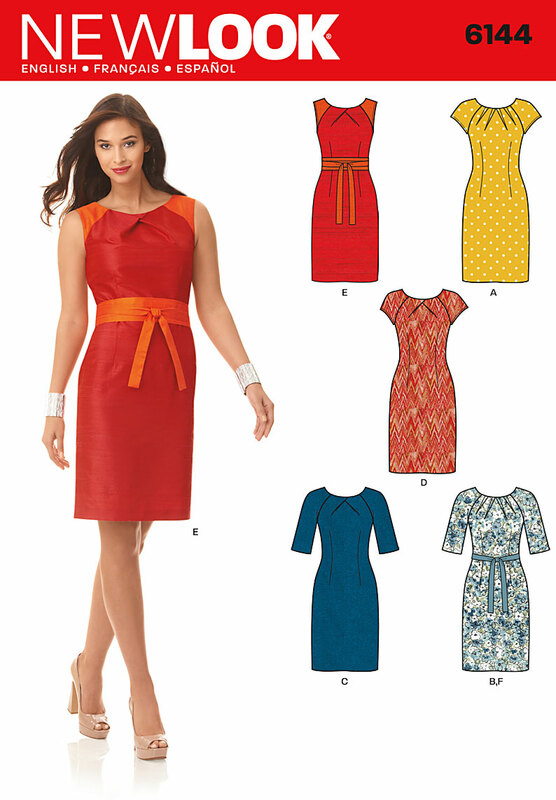 I found several dress patterns that had fun necklines and yet seemed like a quick sewing fix. That's what this Newlook 6144 (out of print now!) was and I knew it would be a perfect addition to the winter dress library. This dress was also work appropriate. This is something I've been rolling around in the old noggin for a while now and I'll be doing more posts about, but work appropriate clothes can sometimes be pretty hard to accomplish. Well, they are for me. I'm wanting to look a certain, professional, yet fun, exciting and stylish way and the two get sort of blended together in a way that doesn't always work for me. I decided to use a stash piece of fabric. All of the fabric was stash, actually (yay! I'm so proud of myself!). I was determined to use stash! The body is Linton Tweed and it is pretty thick. Quite thick really, and warm - perfect for snowy days. The sleeves are a navy wool crepe I had and then I lined the dress in bemberg rayon lining - some bits and bobs that I had lying around so that I could get the pieces used up. I used an invisible zip and used a lining treatment for the vent that comes from my favorite Easy Guide to Sewing Linings book. The tweed was marvelous to work with. It did what I wanted it to do and was very easy to press and shape. I had purchased this fabric a couple of years ago, from the pretty fantastic Linton Tweed online store. To be honest, if you're into fine fabrics much, the prices for these tweeds are not really as much as I was anticipating they would be - I mean don't get me wrong, they are expensive. I've seen them range from $25 - $75 per meter which seems standard when you're looking at fine unique wools. The shipping is fairly costly, but I remember I received my package within 3 days! I took the time to do plaid matching and was very happy with the way my Pfaff stitched it together using that Integrated Dual Feed! I used the lining trick from this Threads article (same lady who wrote Easy Guide to Sewing Linings) and it's one of my favorite techniques to use with facings. I opted for a more conservative fabric belt and belt loops instead of the OBI belt that came with the pattern. I handstitched the hem and used rayon seam binding for hem tape as a final finishing touch. All in all, this dress turned out pretty great. The fitting was fairly simple, the construction too and I'm thrilled that I have an appropriate winter dress for the workplace - if not a little party get together after! I'm so glad it's warm - like winter coat warm! Yay! Ready or not Winter, here I come! What do you do to keep warm in the winter? How do you work around the holiday dresses that flood the market this time of year and seem ill equipped to deal with winter weather? Is it just me? I just don't know how you wear a sleeveless wispy dress in the snow. 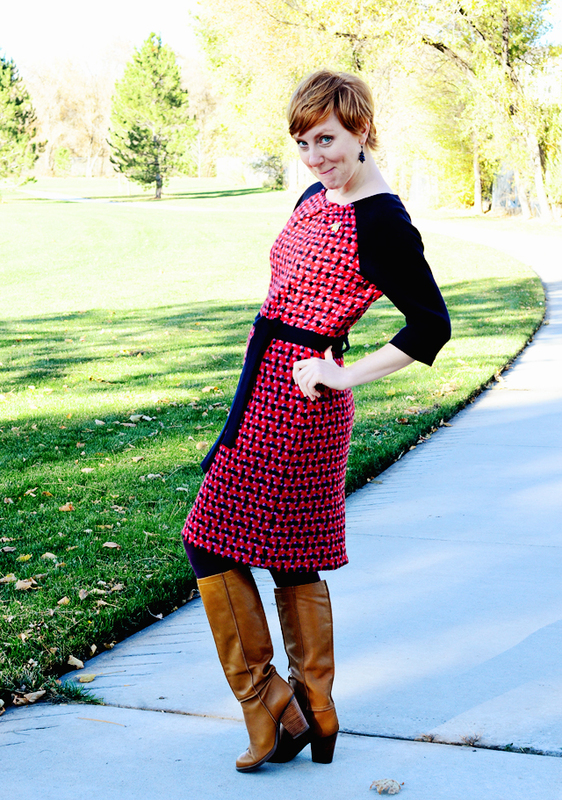 Last, but not least, visit my Pattern Review for a full detailed review of this dress. This looks like the perfect office dress to me - that Linton Tweed is absolutely stunning and well worth the investment. I particularly like the neckline detail. I have cut the pieces for exactly this pattern, and it is waiting to be sewn up; mine is in a blue plaid, which I think will be cute; I love the tweed with the contrast sleeves though! I'm planning on lining mine as well, and was wondering how to handle the shaping at the neck, so I shall follow your example with the darts (I was wondering whether there was a way of moving the darts down into bust darts, but I think it's probably more trouble than it's worth!). I have some sleeveless winter dresses which I wear over a long-sleeved t-shirt (sometimes a thermal one), and/or under a cardigan. I'm in the UK now, and our winters are pretty mild, but I survived two winters in Southern Ontario, mainly by layering! Gorgeous dress! Great job on the lining, it looks so perfect! This looks lovely - an absolutely ideal office/party dress! This is a beautiful dress. I too have bits of Linton tweed in my stash (I live about 20 minutes from there shop!) but I am too scared to do anything with them because I think they need underlining etc. But yours has inspired me! Love the pattern and combination of fabrics. 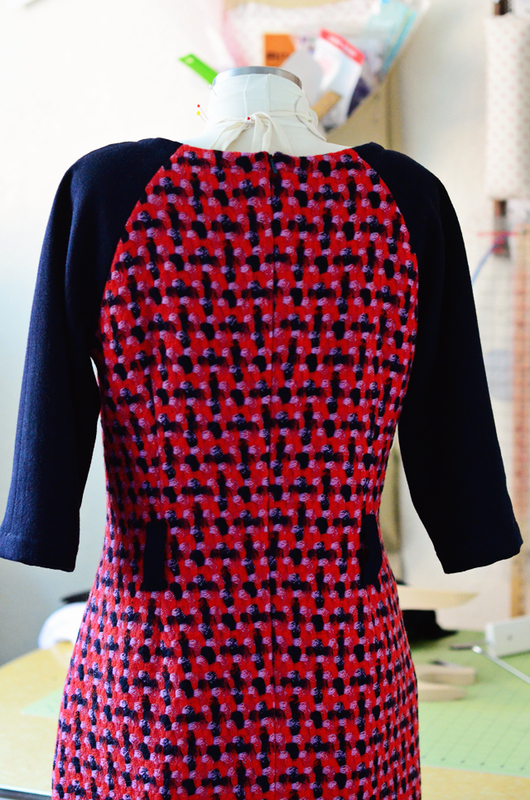 That's the great thing about sewing - you can make your own winter dress even if there are none in the shops! This looks lovely Sunni, and I love the look of a contrast sleeve. I wear a lot of sleeveless dresses with a long sleeve top underneath in winter, a similar look. 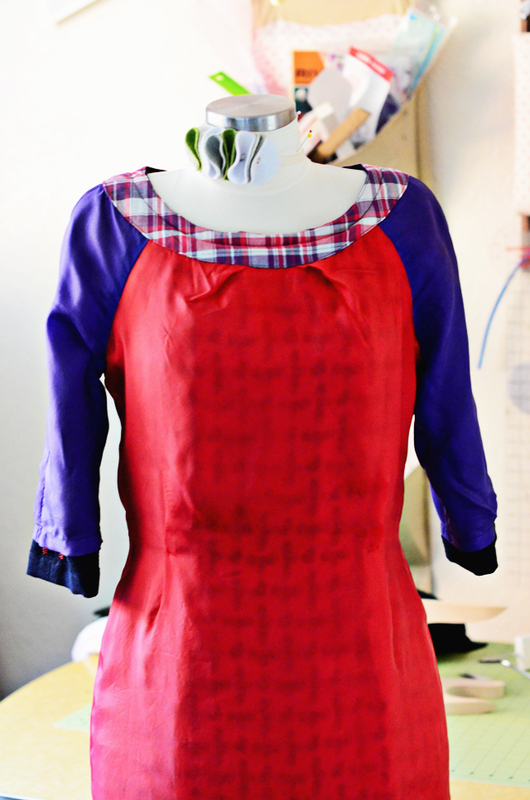 What a great idea to use up odds and ends of lining in the one garment - it looks rather cute! Gorgeous! I love the tweed! Beautiful dress! For those who might be interested, I purchased this pattern last week at a big box fabric store so it may stilll be available in some locations. 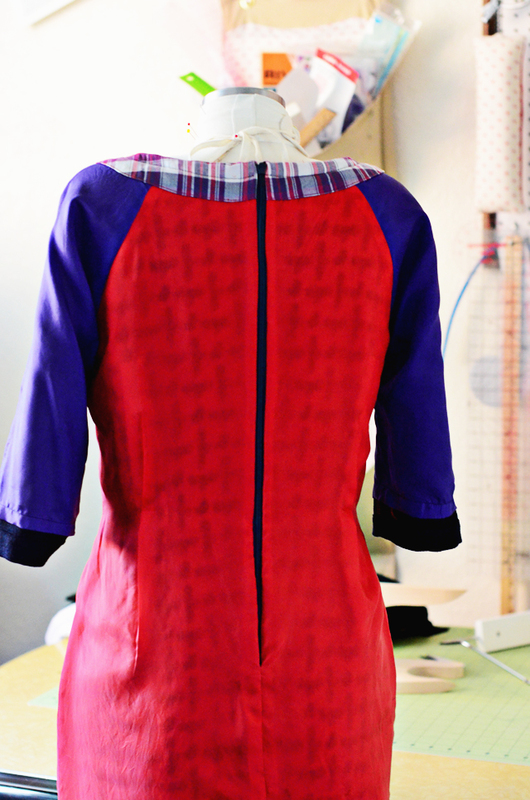 Seeing the pattern made up so beautifully inspires me to get busy on my own holiday dress. Snug and stylish, perfect. Thanks for the link to the lining information, must give it try. Lovely dress. The fabric is stunning! 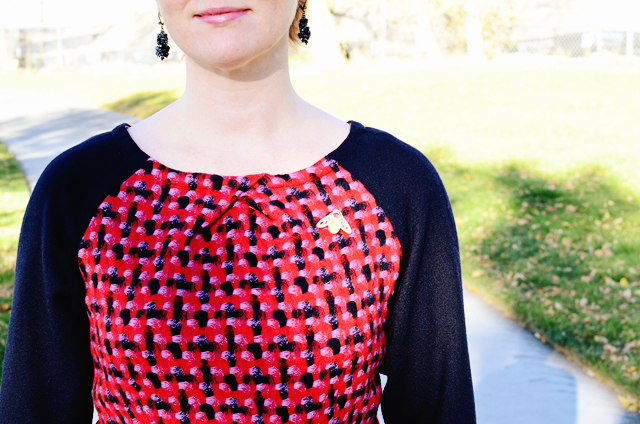 I love that threads article too - - Honestly, I avoid RTW dresses at this time of year. It's simply ridiculous to go out and about with a sleeveless dress, even to a party, and I just don't get the obsession with them. Your dress looks cozy and warm and gorgeous too. What a cheerful looking dress! As someone who lived in SLC, I can agree that wool is a great bet for the dry, utterly crispy cold nights. Going to look for the pattern on ebay. If I can do it in another warm fabric, I'm in. Can't do wool in Seattle, sadly. Great make! I just ranted in my mind last week about the same issue. I live in New England. Why are there sleeveless winter dresses in our stores?!!! 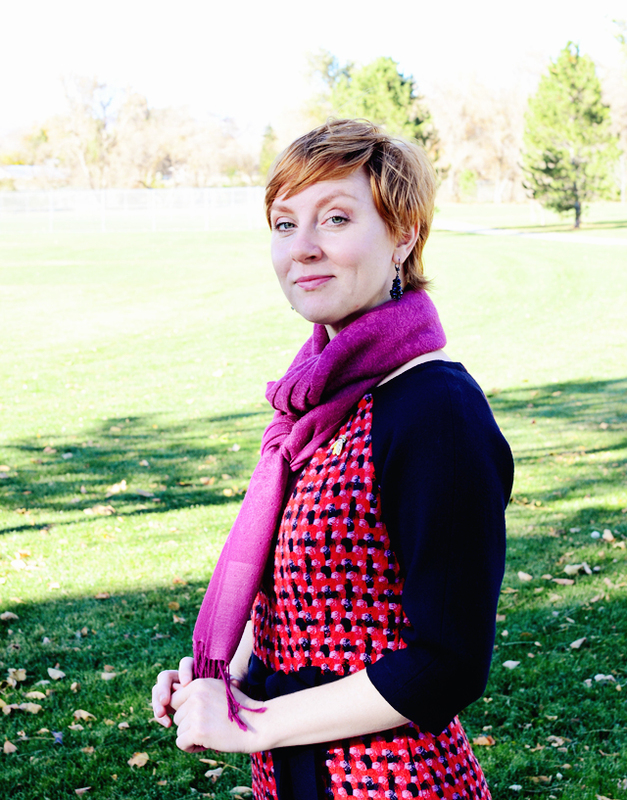 I think last year I gave up on dresses except for one casual dress I made from Malden Mills fleece. I also spent a lot of time thinking about maxi skirts I could line or wear leggings under. I love your dress, and I definitely think it's work and holiday appropriate and just beautiful. I really like your color sense. I was just thinking this very same thing about winter dresses! After I went and made a SLEEVELESS grey wool dress. dumb or what? I guess I'll be wearing it with a cardigan! Love your dress, warm and festive!!! You did a beautiful job! Very cozy, yet still streamlined! 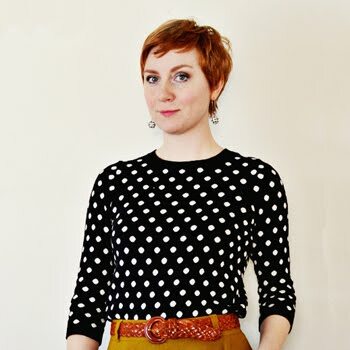 I agree that New Look has some great styles that are overlooked by most sewing bloggers. Haha! YES!! I totally agree with you! Where do these people live that wear those skimpy things? I've got some heavy sweatshirt knit that I want to turn into dresses. I've got a Russian wool coat that I want to turn into a little jumper that I can wear with a turtleneck and wool leggings. 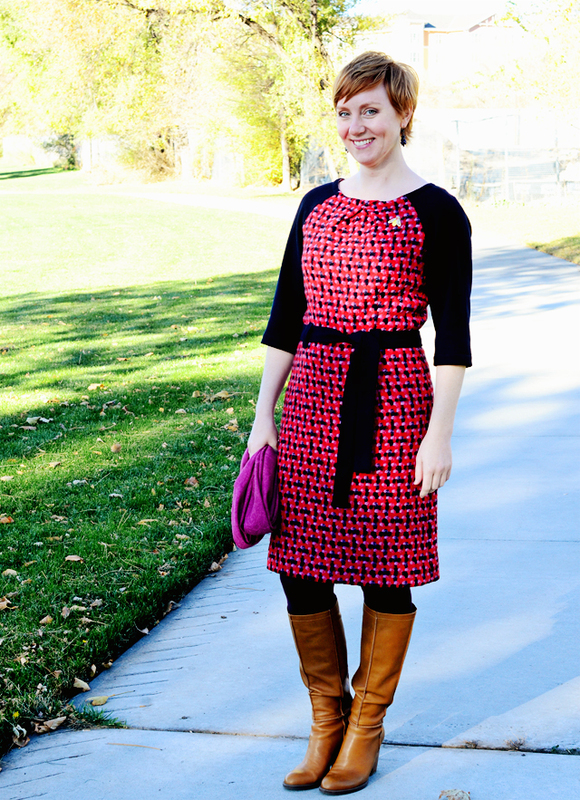 Staying warm, professional and cute is a challenge that you have mastered well with this one! I love this! What a great use of a beautiful wool, I am going to tuck this idea away for when I am finally ready to cut into some of my beautiful wools! Thanks for sharing! I thought about moving the darts too and I too thought it was more trouble that it's worth. With the facing I find that the darts didn't add too much bulk and it gave a little extra room in the section for the lining to move and not be pulled to tightly across the bust. You know I was afraid of the same thing!! I felt like mine was pretty loosely woven, so I decided to put my through a gentle wash and hang to dry. This tightened it up a good amount. When I cut everything out, I was surprised that it held together quite well. It actually did not unravel right before my eyes - so I think you pay for the high quality of the fabric. It's lovely stuff to work with. Just lovely! Thank you Sherry! It's so good to hear from you and I've been keeping up on your blog too. So glad that you are giving us some of your great knowledge and expertise again. I have the same feelings! I just don't get it! I love how they show gals in bare legs, bare arms and stiletto heels too! If it were snowing or even if there were snow on the ground, this would be absolutely silly - not to mention dangerous! Good grief! I can definitely see wearing a sleeveless dress with cardigan though! This a great thought! I was considering some of the same as I have several lovely cardigans this year that would do well over a dress. Great idea! Totally agreed! I rarely see anyone make any Newlooks and they are pretty decent patterns and they come in a great price range. Yay! Now that is classy sewing. Beautiful dress, a classic that will you will wear for years. I love the lining. It also happens to me that I have just enough left to squeeze out a pair of sleeves or a body... 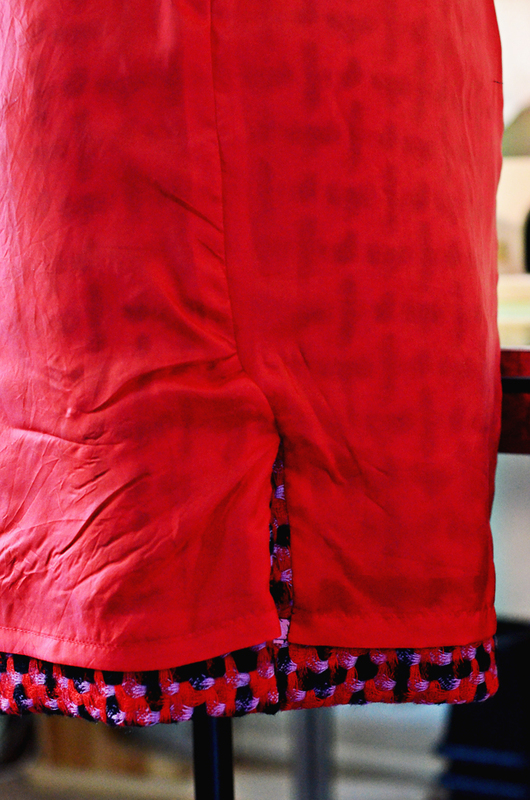 It's a sweet secret if you have such a colourful lining in a very stylish dress! Dress looks great! love your fabric choice, thanks for sharing the lining info, will definitely look into the book you referenced. Excellent fabric choice. This would be a great dress to wear to the office. So glad I found your blog!